The reality of writing is that authors don't make a lot of money. Oh sure there are the successful, rich authors but they make up only the tiniest fraction of actual published authors. If you have dreams of selling your science fiction, fantasy or horror novel and getting filthy rich, you need to adjust your expectations. We’ve collected three testimonials from genre writers below to help aspiring writers to maintain realistic expectations. The average advance these days, for a genre fiction novel, ranges between $2,500 and $10,000. That’s right. The novel you spent a year working on only earns you between $2,500 to $10,000 at first. When the book is published a year later, that advance will have long been spent. And you probably won’t see a royalty check until another year AFTER your book has been published (provided enough copies have sold to earn out your advance). So it will actually be two years from that advance check before you get paid again. Read more testimonials at Media Bistro.. Enter The Eye of the Sword giveaway until the 14th! Money should never be a reason to write or for that matter doing anything. 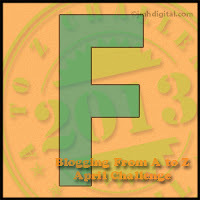 Visting from the A to Z and I like your F pick for the day. .
And don't forget that you are expected to do more and more of your own publicity--which costs.